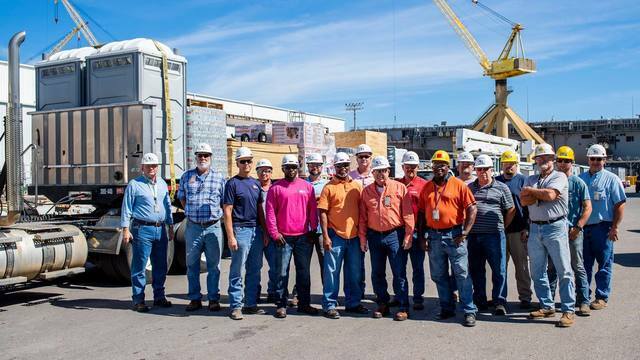 NEWPORT NEWS, Va. (WAVY) -- A crew from Huntington Ingalls Industries is headed to Panama City Beach to help with recovery efforts from Hurricane Michael. The company has a facility in Panama City Beach, so they're headed to lend a hand to their fellow employees after the storm destroyed part of the facility. "Our primary objective is to check on our employees and make sure they are alright," said Huntington Ingalls Industries Manager Gabriel Watlington. "We assembled at headquarters. We talked about a plan to deploying to facilities down there and helping employees get back on their feet ." The crew has two box trucks full of supplies, toilet paper, baby formula and lots of water. They also have self-sustaining supplies for their crew because they don't expect to find running water and electricity. "We will stay down there as long as possible, as long as they need us down there," said Watlington.